February 24, 2011 – Headphone t. | What I got rid of today. ← February 23, 2011 – On media, and personification. Loved it, but...time to go. 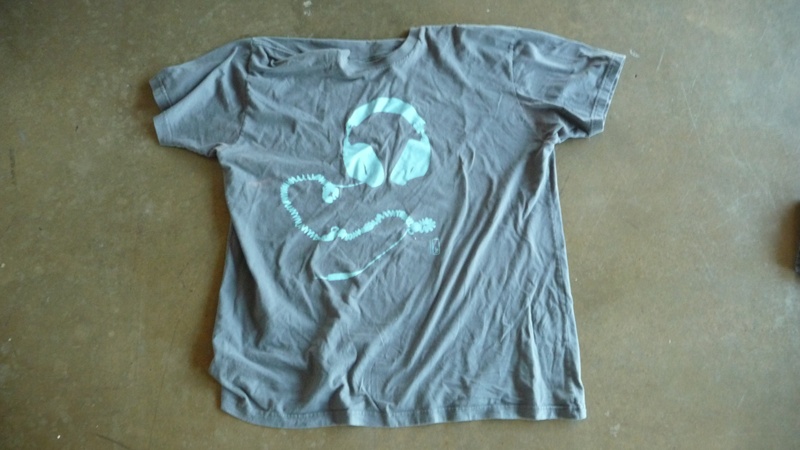 As I’ve blogged about before, I love my collection of t-shirts. And this one, which simulates a pair of headphones worn by a DJ…is one of my favorites. But, I went back to my “rule” about tees I love – that they’re understood by about 10 percent of the population. A good t-shirt, to me, will get a knowing smile from about 1 out of 10 people…and a bit of a confused look from the rest. Suffice it to say, this shirt is more like 75 percent. And so, today it goes. Here’s to bigger messages to smaller audiences. I know some brands who could learn from this. PERSONAL ANECDOTE: I’d like to welcome the new readers I have to this blog, due to my speech at the Ignite event last night. I know you’re out there…I had more blog traffic yesterday than I’ve ever had before. So again, welcome. And more importantly, thanks for the kindness you showed me last night from the audience. It was a pleasure meeting many of you in person…here’s hoping I meet many more of you soon. This entry was posted in Clothing, PERSONAL ANECDOTE. Bookmark the permalink. 5 Responses to February 24, 2011 – Headphone t.
Loved your talk at Ignite last night and you have inspired me to do a similar project. Question, what do you do with all you get RID of? Trash, Goodwill, friends? Thanks Bethany…glad you liked the talk. I keep them in my possession for about a week…to allow my friends, Facebook followers, etc. to ask for the item. If they want it, it’s theirs. After that, I give them to a worthy cause. Hope this helps! Let me know how your project goes! Thanks! My birthday is on Monday and my coworker’s (who was there last night) is tomorrow. We are both going to start to on our birthday’s. I’m so excited! Thanks for your presentation at Ignite last night – it was one of the best. My friend (with whom I attended Ignite last night) and I have some ideas about how to get rid of the blog on Day 366. I’d like to grab a beer/coffee/whatever when you have time. Happy Hour?